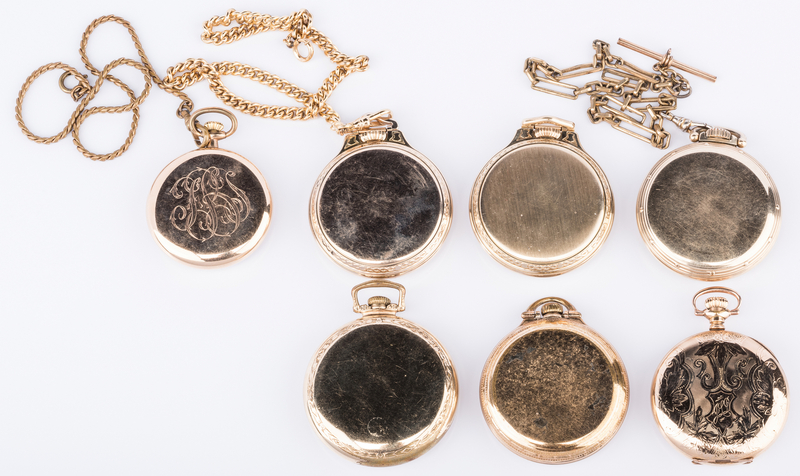 Six various railway pocket watches and one Elgin pocket watch, 7 total. 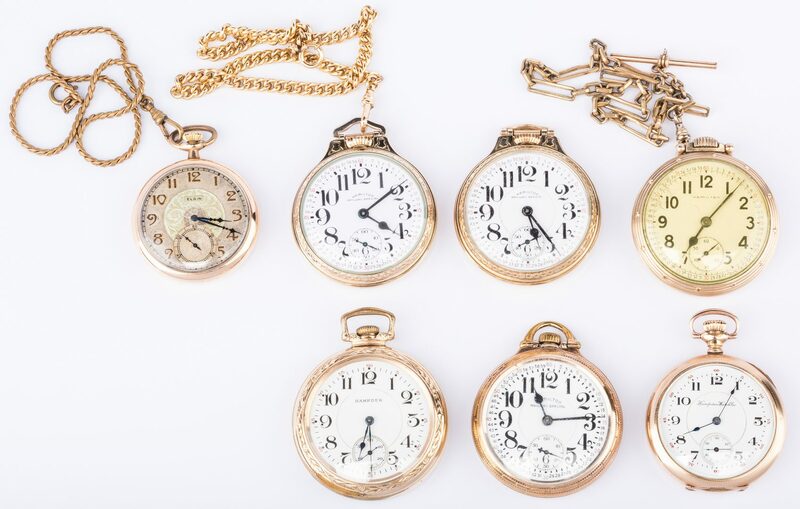 1st-3rd items: 3 Hamilton Railway Special 992B 10K gold-filled pocket watches, 21 jewels, 2 with white enamel faces, 1 with yellow enamel face, all with Arabic numerals, sub seconds dials, serial numbers C523537, C287630, 4C148876, 2" W cases, 2 with metal watch chains. 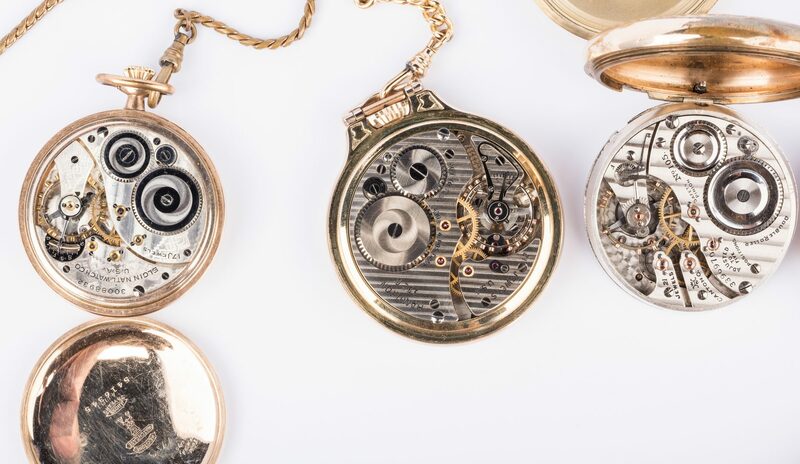 4th item: Hamilton Railway Special 992 10K gold-filled pocket watch, 21 jewels, white enamel face with Arabic numerals, sub seconds dial, serial number 1732904, 2" W case. 5th item: Hampden Railway watch, 21 jewels, No. 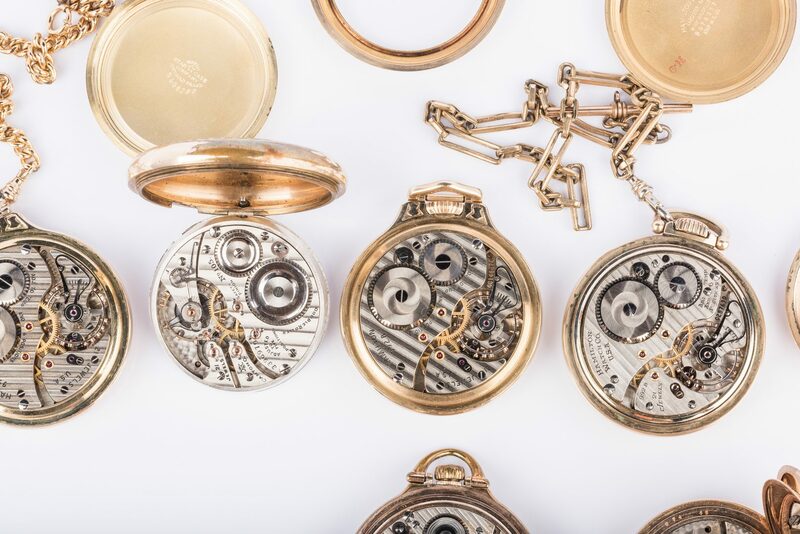 105, 10K gold-filled case, serial number 3396970, swinging ring case, white enamel face with Arabic numerals, sub seconds dial, 1-7/8" W. 6th item: Hampden Railway watch, 17 jewels, 10K gold-filled case, serial number 2765893, white enamel face with Arabic numerals, sub seconds dial, 2-1/8" W. 7th item: Elgin pocket watch, 17 jewels, 10K gold-filled case, serial number 30088932, Arabic numerals on embossed paper dial with sub seconds dial, 1-3/4" W plus metal chain. Provenance: The Living estate of John and Donna Rogers of Greeneville, TN. CONDITION: Only Elgin watch running at time of inspection. 21 Jewel Hampden watch starts then stops running at time of inspection. Watch faces in overall good condition. Yellow face with some surface scratches. 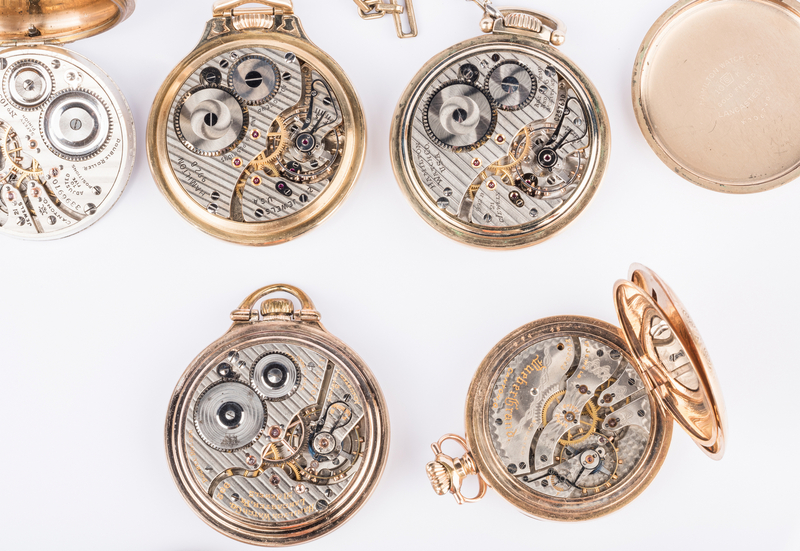 Cases with acceptable wear due to age.